Gary would tell you himself that he likes working in large, space or site specific installations. With that said, he has graciously accepted the chance to create smaller assemblages specific to our Featured Member Exhibition space. A selection from his photography series “Document Ephemera,” which documents his previous outdoor, temporary, site specific installations, will also be on display. For more about Gary John Gresl, read his bio and artist statement below, and visit his website. Join us for the opening reception on Friday, April 17 during Spring Gallery Night. Gary John Gresl, like so many other artists, traces his art interest back to childhood, though he did not began to seriously create and exhibit his works until the early 1980’s. He quickly moved through painting in styles of geometric abstraction and abstract expressionism, soon finding these directions to be dead ends without personal satisfaction. 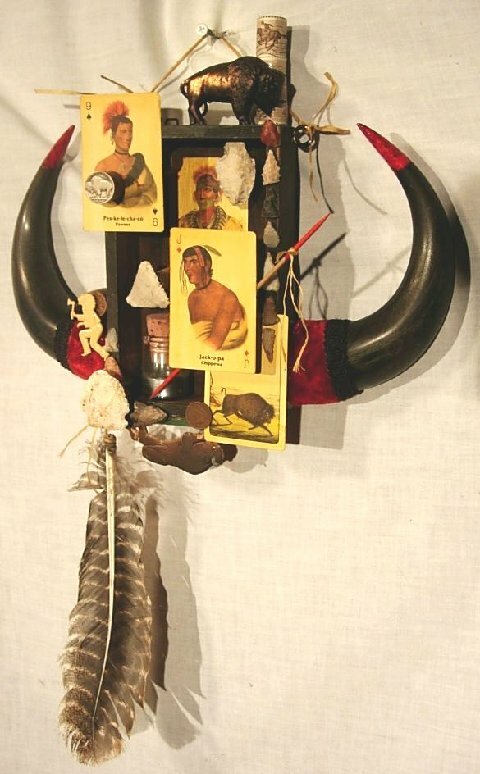 It was when he began to blend his interest in objects, specifically antiques, with his sculptural expression, that his assemblage work came to be his sole focus. Gary likes to work large, including creating room sized site specific installations. The works here in WPCA include some small sized assemblages which he had created for specific venues, plus a couple mid sized works. There are also a few photographs of outdoor temporary site specific installations, these photos being part of a series he calls “Document Ephemera”. This outdoor work deals with considerations of the longevity and endurance of art objects, and what popular art culture expects. Gary has been a life long resident of Wisconsin and ties his form of expression and choice of materials directly to experiences in its rural and rustic places. After high school he had hoped to attend an art school such as Layton, or an art department in some UW college. However, his parents steered him toward teaching elementary school children, which he did for five years. For 3 1/2 years of that period he taught art and reading classes. While an undergrad he managed to take art and art history classes, besides completing his degree in education with a music minor. 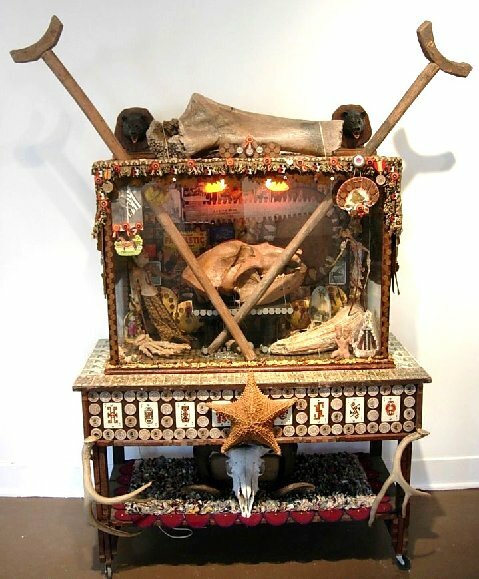 “Grandfather’s Souvenirs.” Acquired by Museum of Wisconsin Art. After teaching those five years in Brillion, WI, he attended UW Madison and got a Master’s degree from the School of Human Ecology. When he chanced upon that department he found it to be a good fit because he could build a program of classes including art history, history of interiors/antiques, history of costume and textiles, and classes in Museum Training and Connoisseurship. After completing his MS he began work in the field of antiques while doing self study of modern art history after 1900. He eventually discovered how to blend his strong interests in art objects, antiques and progressive art thru his assemblages. Gary has been the President of Wisconsin Visual Artists/Wisconsin Painter’s & Sculptors for 4 terms, and otherwise active with colleagues in Wisconsin attempting to broaden interest in the visual arts. He taught adult classes in Antiques and Collectibles at UWM, UW Sheboygan, UW Fond du Lac and Mount Mary University. Along with Tom Lidtke, Director of the Museum of Wisconsin Art, Gary founded the Wisconsin Visual Art Lifetime Achievment Awards in 2004, and received that award himself in 2008. He also was a Mary Nohl Fellowship Awardee in 2007. Spring Break AwA at WPCA!